Key player and workhorse the Sprinter is more than a vehicle, it's a true partner you can always rely on to support you all the way when there's a job to be done. As the van that established a whole vehicle segment, the Sprinter has been ahead of the crowd since 1995. Its 7G-TRONIC 7-speed automatic transmission is testament to that. It is known above all for its outstanding operational reliability which gives users the freedom to concentrate fully on their business activities. The latest generation of the Sprinter lives up to this impressive reputation. It is the result of the process of continuous development with which we ensure that the Sprinter always offers the best in terms of reliability, quality, safety, flexibility, economy, sustainability and service. The 7G-TRONIC 7-speed automatic transmission, combined with a wide range of equipment options and safety packages, means the Sprinter meets your expectations to the full. And with its forward-looking design it once again asserts its pioneering character - even more advanced, even more flexible, even safer and even more efficient. Mercedes-Benz Vans. Born to run. When we designed the Sprinter, we took on board all the ideas that can help to make your everyday work easier. For example, the panel van's cargo volume of up to 17 m3 can be loaded from three sides. Whatever your transport requirements, your Sprinter makes it possible. Available in three wheelbases, four body lengths and with three different roof variants, the Sprinter is the perfect transport solution. The most important standard features of your Sprinter are directed towards your safety. 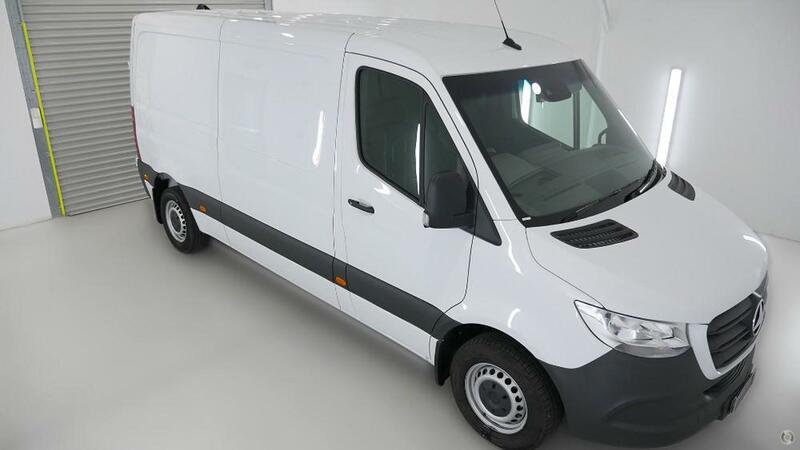 It is the first van to be equipped as standard with Crosswind Assist which uses strategic brake applications to counter any tendency to drift off to the side of the road and so helps you stay on course. Its innovative ADAPTIVE ESP dynamic handling control system takes account of the load status to improve directional stability and traction in critical situations. ADAPTIVE ESP is complemented by a number of functions, two particularly important examples being Disc Wipe and Electronic Brake Prefill. The Sprinter has no need to hide behind any passenger car when it comes to safety specifications its unrivalled safety packages are unique in the van segment. One of the highlights, a component of the Driving Assistance Package, is COLLISION PREVENTION ASSIST. This system gives visible and audible warnings if there is insufficient braking distance and provides assistance with emergency braking. Your Sprinter is delivered as standard with the Crosswind Assist and a range of standard safety features, such as a driver airbag and front passenger airbag, three-point seat belts with belt tensioners and belt force limiters for the driver and co-driver (where a single co-driver's seat is fitted), head restraints with 2-way adjustment, load securing rings, a hydraulic braking system, adaptive brake lights and heated exterior mirrors with integrated additional wide angle mirrors. In addition to all this you can choose from a broad spectrum of further equipment options for even more safety. High quality standards and solid resale values contribute to the overall cost-effectiveness of the Sprinter, as do its highly sophisticated engines. When equipped with the advanced OM 651 4-cylinder CDI diesel engine, available with a choice of three power outputs, or the outstandingly capable OM 642 V6 CDI diesel engine, the Sprinter sets standards in terms of economic efficiency and future-compatibility. Fuel consumption can be further reduced with the ECO Start/Stop system which comes standard on all 4-cylinder Sprinter models with manual transmissions, and provides an intelligent solution to engine idling. What's more, the exhaust gas after-treatment also reduces emissions of pollutants such as nitrogen oxides. All Sprinter models come equipped with BlueEFFICIENCY technology which is energy efficient and fully optimised for lowering emissions. If you'd like to find out more, then please drop us a line today. Established in 1978, we're a family owned business that has earned an impeccable professional reputation by providing friendly service and sound advice to our many happy customers. We go to great lengths to understand exactly what it is that you need, and we capture your desires with our unique sales and service checklist. With over 40 years of operation on the NSW Mid North we know you will enjoy our hassle free way of doing business we'll make sure you Drive Away Happy!